Whenever Jack and I travel to L.A. to visit his family, we always share a large family-style meal at Carousel Restaurant in Glendale. Jack’s family is of Armenian descent, spending much of their life in Beirut before they moved to Southern California when Jack was a child. 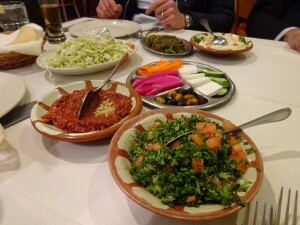 They tell me that Carousel is the best, most-authentic Lebanese restaurant in the L.A. area. I can’t vouch for its authenticity, but I will say that it serves incredible food. Carousel has two locations, one in Hollywood and one in Glendale. I’ve only been to the Glendale location, and it is a large airy space with indoor and outdoor seating. 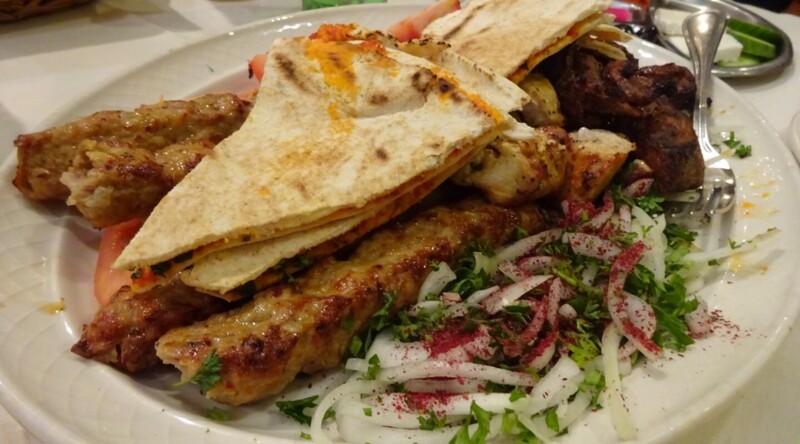 It is perfect for large groups, especially since the food is designed to be shared. The walls are decorated with ancient swords and trinkets from the Middle East, as well as photos of Lebanon. Lebanese Meza: sarma, hammos, pickled beets, carrots, cheese, cucumber, olives, tabbuleh, muhammara, cabbage salad.